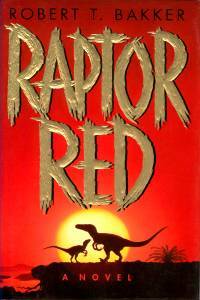 Random And Some: "This spot and this family are mine"
This weekend I read Raptor Red (1995) by Amercian paleontologist Robert T. Bakker. Since I'm going through a Jurassic Park phase, I'm trying to get my hands on every worthwhile dino book out there, with Bakker's Velociraptor adventure a great start according to many lists. As you may or may not know, Bakker served as a consultant to Steven Spielberg when he was working on Jurassic Park, ensuring that the movie's dinosaurs exhibited scientifically accurate behavior. Spielberg, however, used dramatic license when it came to some aspects, modeling his famous Velociraptor after the Deinonychus (a raptor subspecies) and making it much bigger. In a bit of good fortune, a new, much bigger species was discovered during Jurassic Park's production. 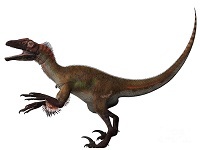 The Utahraptor - found in 1992 by Bob Gaston and his team - was almost exactly the same size as JP's big female. Raptor Red takes place 120 million years ago, in the Early Cretaceous period. A group of foreign dinosaurs, among them the Utahraptor species, invades present-day Utah after a land bridge had formed between Asia and the Americas. When Raptor Red, the heroine, loses her mate ambushing a herdof Astrodon, she decides to follow a familiar scent and is soon reunited with her sister, a single mother with three chicks. The two hunt together and take care of the young, having great adventures along the way. They survive an Iguanodon stampede, escape a flash flood, evade Acrocanthosaurus, and much more! But will Raptor Red find another mate? Have you ever had a teacher who seemed to just tell stories all the time? And you were so enthralled by it that you clung to his every word and actually absorbed what he was saying? Well, I have some news for you. Bakker is all about teaching through narrative, turning data into a heartwarming and touching look into the world of the Raptor, through the eyes of a Raptor. From the extremely unique POV of one of the smartest carnivores to ever live, and without a human in sight, Raptor Red offers an exciting look into life of Cretaceous dinosaurs. This is entertaining knowledge at its very best, even if Bakker is sometimes loose with scientific fact. Go read this!